For all of his critics, Friedman was one of the most successful advocates of economic liberty in the world. The application of monetarism to minimise inflation has been a dramatic success. That change has seen inflation disappear as a major concern in the western world – those government no longer effectively print money to pay deficits, they no longer destroy state debt by engaging in the brutal theft of people’s savings through inflation. People under the age of 30 will not remember a time in New Zealand when inflation was consistently above 10%, motivating many New Zealanders to invest in property to protect their savings from the ravages of governments of both National and Labour who would effectively borrow and print their way out of short term problems. He was a man for more than monetarism, he generally was a Hayekian, believing in individual choice over state control, and believing that people who were free would be more likely to better themselves, than those subject to regulation and state provided monopolies. He advocated floating exchange rates, the use of education vouchers so that parents could choose private schools instead of simply public schools and supported replacing state welfare with a negative income tax system. However, he should not just be remembered for his economics. He was also a social libertarian, he opposed the military draft and supported decriminalisation of narcotics and prostitutions. He believed in freedom in the personal and economic sphere, and as such was a libertarian, although not as strictly libertarian as myself. Friedman’s views got an ear most notably in the Reagan and Thatcher administrations, but also Bob Hawke’s administration in Australia, and in New Zealand with Roger Douglas and the fourth Labour government. His critics may focus on his priority of inflation over unemployment, ignoring that inflation unlike unemployment, offers little to no chance for escape. Today in those countries that have implemented monetarism, inflation is both relatively low and so is unemployment. For all of the wailing and gnashing of teeth at the time, the Clark government has embraced monetarism with a slightly increased inflation target, Jim Anderton, once a strident critic, is part of a government that maintains it. Having been part of a party that opposed it intensely, Tony Blair and Gordon Brown gave the Bank of England independence in meeting its inflation target. That is Friedman’s legacy. His advocacy of low inflation has saved hundreds of millions of people from having their savings eroded by government profligacy. We take it for granted now, and there may be a case for a different approach (free banking) in the future – but he is to thanked and it is an indictment on public education that this man is not seen as the hero he should be. Now if only he could now tell John Maynard Keynes how wrong he really was! Good words there LS. If we can rival his achivements we might achieve our goals for New Zealand. But thank goodness we don't have to rival his economic achivements! 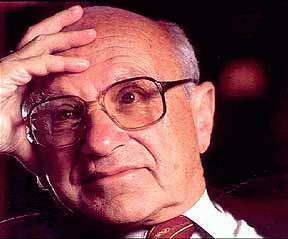 Milton Friedman will definitely be remembered by New Zealanders. His influence behind New Zealand's economic reforms was the best thing that ever happened to New Zealand. His reforms required many years of painful change, though, but in the end they paid off. I only wish the same theory would apply to free speech, though, which is presently being removed by the politically correct. Why not let the market decide what is correct and incorrect speech? The restriction of speech and affirmative-action style policies are a form of protectionism, which permitted to continue, will end up being the demise of the free market. How will businesses remain competitive when univerties restrict free speech and the development of new ideas? How will government departments, educational institutions, and private organizations that apply affirmative-action policies remain competitive when the are not permitted to employ the most qualified person for the job?